Hey Democrats. 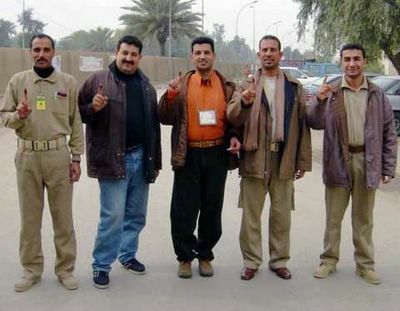 Take a good long look at the faces of these men we have freed in Iraq. Compare their time at the polls where they could have been killed, with what you complain about... Four hour waits at the polls in Ohio, hanging chads in Florida. You should be ashamed. Over 70 percent of Iraqi's voted. I guess they shamed us all with our poor turnouts. I like the photo posted by Treacher. Who's calling Bush an idiot now?